Kathy Clark was the very happy of the winner of the Passport to Art draw after the 2017 Uxbridge Studio Tour. Kathy had never been on the Uxbridge Studio Tour before but had always wanted to visit the Claremont studio of artist Sally Wildman. 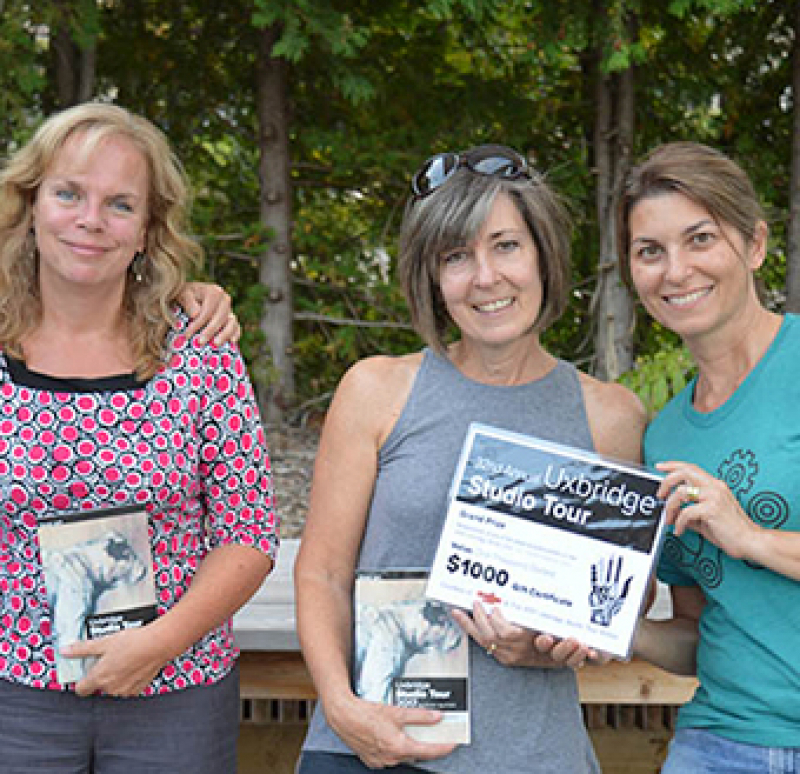 When a 2017 Uxbridge Studio Tour brochure featuring a piece of Sally’s work on the cover landed in her mailbox Kathy knew that this was the year to enjoy the tour. Kathy and her good friend Heather Elrick planned the day together, mapping out where they’d go, taking turns deciding on which studios to visit. Starting off with the studios closest to Claremont – Sally Wildman, Gayle Temple and Colin Whitebread – then heading north to the studios of Cynthia Cupples and Gretel Boose, and finally finishing off at the Uxbridge studio of Mike Wilkins. “I got joy from that day,” said Kathy who holds a degree in art. “I had the opportunity to really enjoy art again." “It was a fantastic event,” raved Heather. The 2 friends had been diligently collecting ballot stamps along the way and when it was time to drop off their ballots they made a pact that if one of them won then they would split the prize with the other. Seeing the number of ballots that had been collected at Mike Wilkins’ studio they were convinced that there was no way either of them would win. “I told Kathy we don’t stand a chance. Look at how many ballots there are just here,” recalls Heather. As it turns out, Heather was wrong. On Friday September 22 at The Second Wedge Brewing Company it was Kathy Clark’s ballot that was drawn from the giant garbage can full of ballots! “When Lesley called to tell me I’d won I actually had to ask exactly what I had won. I couldn’t believe it,” says Kathy. “Ten minutes before the phone rang I had been going through the brochure showing my husband the studios we had visited and telling him about the art we had seen." “I had been planning to call Kathy to tell her I had won, just as a joke,” says Heather. “So, when she called me I thought she was joking!" So, what are the winners of the $1000 gift certificate going to spend their portion of the prize on? “I’m definitely heading back to Sally Wildman’s studio. Sally has a painting of a crow that I absolutely love.” says Kathy. Heather isn’t sure yet what she’ll spend her half on but continues to look through the brochure and website trying to decide. The $1000 Art Gift Certificate prize was the result of a new partnership between our Lead Sponsor, The Second Wedge Brewing Company, and The Uxbridge Studio Tour aimed at inspiring local people to explore the incredible talent of artists and craftspeople in the community. No matter what Kathy and Heather decide to spend their winnings on the women will end up with a piece of art that will always remind them of a great weekend spent together exploring the Uxbridge Studio Tour. Drink Local Great Beer @ The Second Wedge Brewing Company.